Thanks to Andrew Cooney for the report and Dave Tonge for the photos. 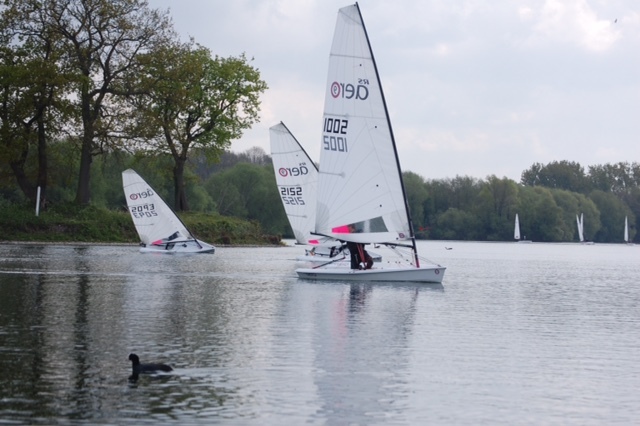 Eighteen sailors from across the UK took part in Broadwater Sailing Club’s second annual RS Aero open meeting sponsored by SpeedSix, sharing a tranquil lake with around a dozen Miracles. Unfortunately no one was able to deliver any other miracles in the form of a decent breeze for Race 1. Light winds were forecast for the morning slowly increasing during the day and all eyes were on race officer Dave Weatherhead to make the best of a tricky wind. The RS Aeros shared a common start for both the 9s and 7s with the final results worked out based on yardstick. For the first start was a tight line close to one of the jetties race and the first leg was a beat from one end of the lake to the other, but the line provided a good bias and the fleet got off cleanly. Splitting off down both sides of the lake, most of the 9’s found themselves clear of the fleet by the first buoy, only to hit the doldrums and then needing to negotiate a tricky cut between two islands. This allowed many of the 7s to catch up as the fleet concertinaed. When the wind returned the 9s all accelerated off led by Dave Cherrill, Pete Barton and the Rolfes (Nigel and Ben, senior and junior). However, they couldn’t shake off the leading Aero 7, sailed by Neil Parsloe from Broadwater, who was also the leading master over the weekend. As the shortened course flag fluttered, Cherrill (also from Broadwater) had a final battle with Barton and Ben Rolfe on the last beat, snatching first place by less than a metre on the final tack to give the local boats bragging rights over lunch. Chilli and baked potatoes with generous helpings of apple pie and chocolate cake were taken early to give the wind a chance to fill in. As the wind picked up it also swung right round, requiring an entirely different start line and a new course, which would take the fleet right round the lake. Another clean start saw Cherrill leading once again with Barton and Rolfe senior again on his tail. More patchy wind again favoured the light wind specialists and places changed at the front many times, but the new course certainly allowed a better variety of sailing legs. Final positions in race 2, after handicaps, were Cherrill, Parsloe, Barton. For the final race the wind freshened and steadied as promised by the forecast. The start of race 3 proved challenging with a heavy port bias and the normal row of starboard boats cluttering up the entire line. Cherrill gave everyone a chance this time by being over the line, leaving Barton making the most of a great start to secure 2nd overall by leading the entire race, and everyone enjoying the increasing wind, with occasional planing by the end. Barton was followed by Nigel Rolfe and Paul Bartlett with Rolfe junior (Ben) getting a 4th and sealing 3rd overall. Lots of prizes, including some generously donated by SpeedSix, sent all the competitors home with a prize. With the sun still shining and more chocolate cake all round, the day ended on a high note and full stomachs. 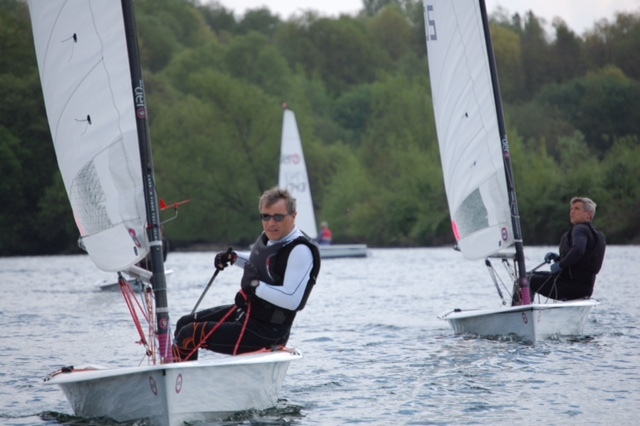 Special mentions go to Alice Lucy (Rutland SC) as first youth and first lady, Neil Parsloe as first Master, Tim Alden (from Broadwater) for braving his first open meeting, as well as Rob Beere (Frensham) and Chris Parker (Broadwater) for their first outings in an Aero. Many thanks to Broadwater SC for being such excellent hosts at their beautiful hideaway. Next up on the RS Aero UK calendar is a busy weekend on the 6/7th May with three events to choose from. RS Aero opens are in the South at Reading SC on the 6th and in the North at Yorkshire Dales SC on the 7th. Yorkshire Dales also have a class training day on the 6th with Matt Thursfield to get warmed up for their event. For those in the Southwest who fancy some sea practice ready for this summer's big events Paignton's POSH single-hander open is 6/7th on Torbay. So no UK Aero sailors will need to drive more than a couple of hours max for their fix that weekend! Full details of all RS Aero UK events are on the UK Event Calendar.